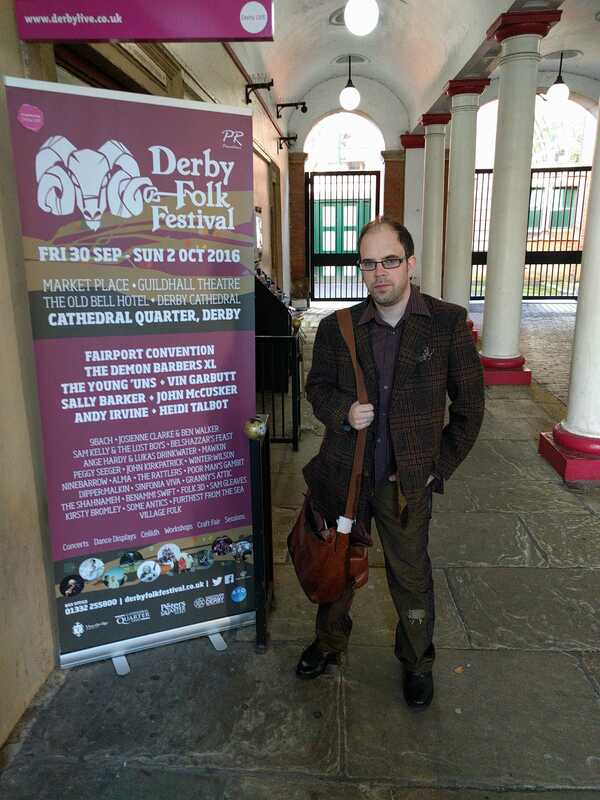 Derby Folk Festival has been a really good event, I have seen some great acts over the three folk-filled days and wanted to give a rundown of the bands that have come on to my radar since the weekend. There were many big names, there were some energetic new acts and a variety of performances that covered the entire folk spectrum, some I have written about more than others- it is no indication of who I thought was the best (that would be a hard task). Grab yourself a hot drink, sit back and have a peruse below. Feel free to add comments, let me know what you enjoyed and who you’d recommend to see in the future! Filled with stories heaving with imagery, colour and flash in a series of tellings from the poet Ferdowsi over a thousand years in the past, “The Shahnameh” feels like the influential, cultural artifact that we have never heard of. 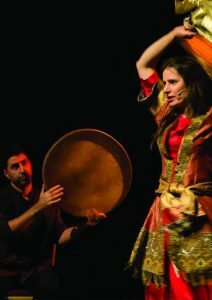 Persian in origin and epic in nature, the atmospheric music (from Arash Moradi), sheer experience and versatility of the main storyteller (Xanthe Gresham Knight), creative use of scenery, and the gentle, engagement of the audience all contribute to an extra special piece of theatre. See my full post on it now here. 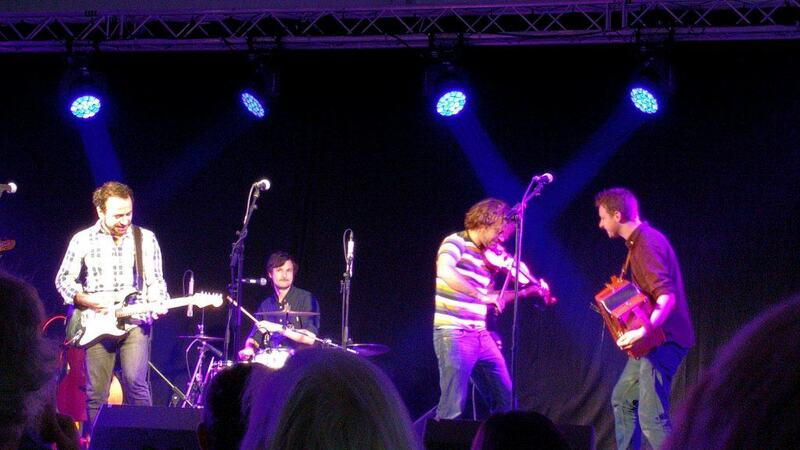 Derby has it’s own brand of Celtic Folk Rock. I never knew because it has been hiding for a few years, but the Rattlers are back. The Rattlers were big in the 90s, a local treasure of sorts but split in 1999 to do their own solo work and things apart from each other. Coming back together at the Old Bell ballroom for the first time in a good while it certainly felt that anticipation was going to be high from fans. Playing to a mixed crowd of some young, some older. the room seemed to teeming with gold memories and remembered riffs, and it is fair to say that as they did come back, they accomplished a powerful and dedicated set. 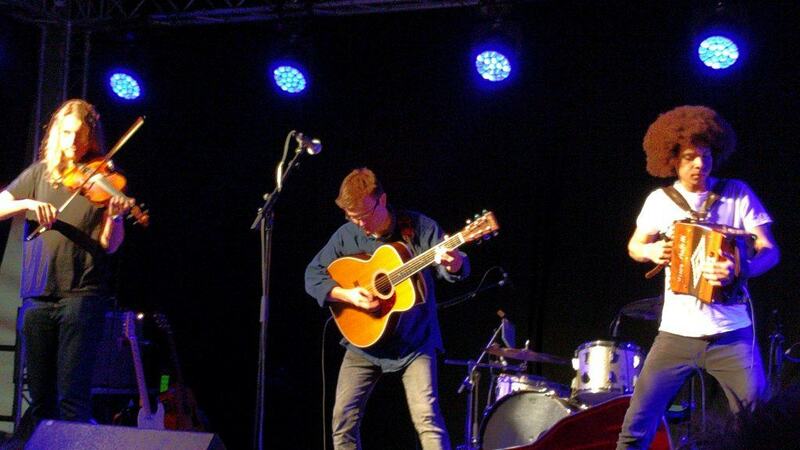 I will be the first to admit that I do not run towards folk-rock as my first choice in a festival but The Rattlers gave me a taste of what I was missing in having this misapprehension. One of my favourite songs had to be “Down, Long Way Down” a highly rocking, energetic snake of a song from yesteryear telling of misfortune and the poor educational qualities of gun-play. It struck a chord (in my heart) and reminded me of the great variety of folk music and rock and how sometimes you want something with a bit more legs. The much more folky number, “Roll Away the Blues” was also an encouraging and rousing song and worth the entrance alone to see these guys. The Old Bell Hotel was a cool venue, the oldest pub in Derby with wonderful memories carved into the wood and fantastically situated in the heart of the city. In a sense they are a bit like guardians of Derby’s rock soul, Thor in Asgard. The Rattlers were rocking with the best of them and even if this grandiose description is too much, on another level it felt is like a few hours with some good mates. Time doesn’t seem to have faded their joy and with their slight blues influence,throng of electric guitar and hint of fiddle they are certainly a gem of a band that Derby needs to return in full. 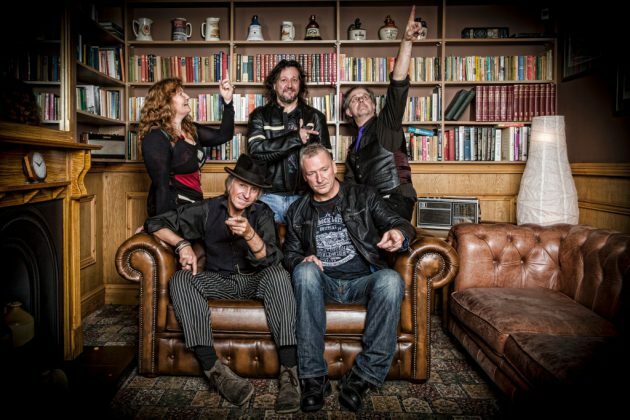 A showcase for homegrown live music, it’s honest and melodic rock which blows away the pretension of lesser musicians into the water with their solid, polished performance. 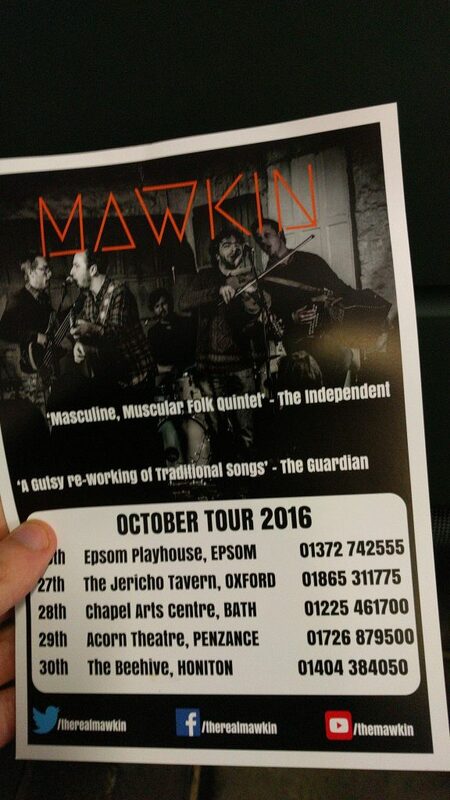 This is the first time I had seen and heard Mawkin in any shape or form. As I often do, I heard several good things about them all over the place and wondered if they lived up to the hype attributed to them. 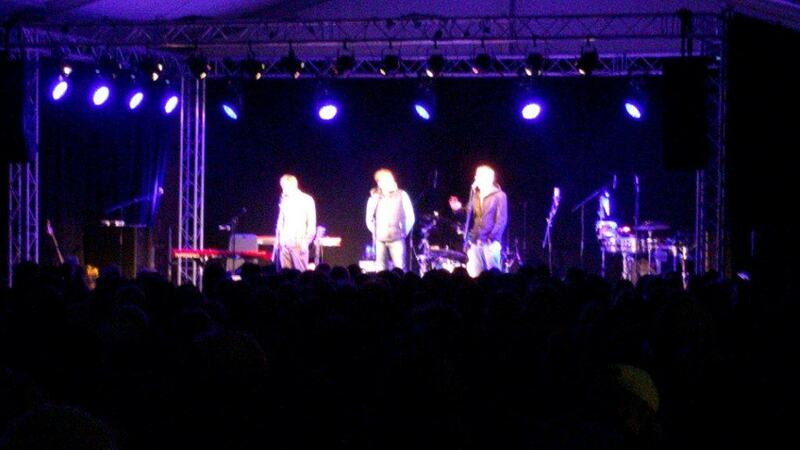 On the stage they performed a number of songs from their third studio album “The ties that bind” and Mawkin were good. In fact they did live up to the hype and then a bit more. A defining part of their music is it’s energy and crossover feel. It would be wrong to categorise their music as second wave ska, but their guitar anthems and undeterred lyrical style does feel like jelly from a similar mold. “Jolly Well Drunk” particularly illustrates that as it shares as much with ska-based drinking songs as it does folk singing songs (see Reel Big Fish’s “Beer” as an example). It isn’t quite as fast as some punk, and it’s not as deliberate as some folk, but being driven by a young, brash and per the title “Jolly” approach it is more the planned staggering of a night out at pub stops than the “lets see what happens” night that ends incredibly messy. One of the added intriguing aspects of performance is the division of their singing voices. The songs where David Delarre lead are kind of rougher, folk and rock for the everyman who is working by the sweat of his brow; songs led by James Delarre are more like the nobleman watching the landscape with mild interest and amusement; these contrasts and differences really build a versatile band. Another great song was “Shangai Brown” described as an “anti-shanty” song that talked about the horrors and misfortune of going away on a boat and warning that the better life is the simple married one. Fresh with great punch and a killer chorus, it lingers in the mind and shows great inventiveness in flipping the concept over. 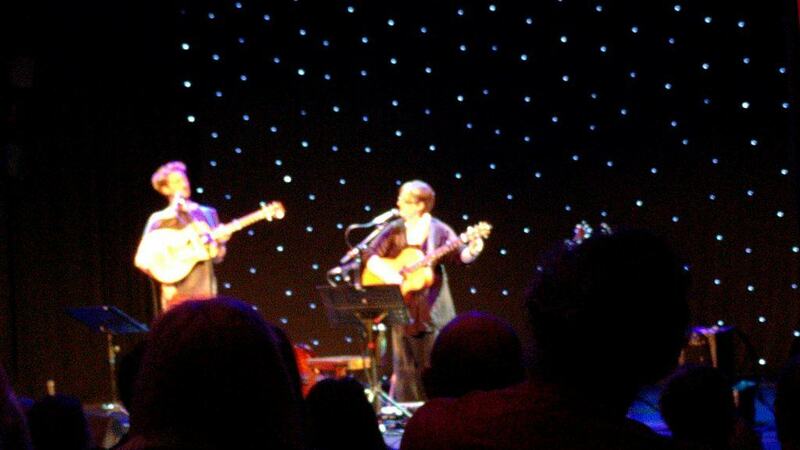 This is all incredibly fun, quintessential folk that I would gladly see again. Granny’s Attic are a group that is definitely needed, their very existence could single-handedly quell the fears of any traditional folk fans worried about the continuation of the form in years to come, but Granny’s Attic are making a concerted effort to take primary interest in folk of this kind. When they perform, the joy is in their energy as they literally cannot keep still. It’s not the well co-ordinated, choregraphed jumping of 30+ year olds like myself working out their moves and hoping to appear younger, but it doesn’t need to be; they are loving what they are doing, and they are doing it well. Much like hot air being breathed through a furnace of folk they have a certain amount of swagger but immense humbleness and respect for the audience. Their organic being is supplemented with confidence in more spades than a deck of cards, “Death of Nelson” is sung with grandeour by the members of the group and “Royal Oak” kicks along at a frightful pace before mentioning their other songs. They are a likeable bunch with one happy, one happy go-lucky, and another with the prophetic voice of doom you get in traditional folk that adds a wonderful character. They are quite possibly a glimpse of the future, it is hard not to feel that they are having some good mentoring and at are building up their repertoire for times to come. One thing is certain, they don’t really need any help with stage presence or enthusiasm, the love is deep and honest without a shadow of a doubt. What can I say about 9Bach? Before the festival I listened to their video, saw all their promotional material, and stared into their neat publicity pictures that see them looking either (a.) cool or (b.) enigmatic. Then they appeared like the still centre of a whirlpool in the Marquee as the rain swept around outside and the festival tent shrugged off the typical Derby weather with indifference. I was not entirely sure what to expect, a question mark hung over decidedly idiosyncratic music and their seeming religion of ignoring genre, but their performance made things pretty clear. It was actually something special. Before you even attempt to go any further, the songs are quite haunting, ethereal and somewhat spectral without consideration of the meaning of the lyrics. “Anian” (also the name of the 2016 new album) is like a funk loop, in it’s performance and tension it fills the gap that exists between full new-age soundscapes and traditional folk based on (and describing the relationship with) the land. There are hints of this within the performances, and as a non-Welsh speaker I would possibly have skirted around the meanings in the songs and relied on my own imagination for what the lyrics were conveying (which might not have been the worse thing, but probably a reduced experience) but Lisa Jên did a good job of explaining and conveying their reasoning for each song’s existence and character. Anian for example it is about the sensory and spiritual connection between people, something untranslatable in English and the song “Llyn Du” on the other hand describes a tormented, frightening black lake Queen that lives in the body of water and haunting your dreams. Jen’s voice is a rising, piercing sound amongst the amorphous cold waters, and the bass sounds like it is propelling a river of stone through the waves. The whole thing is primal and atmospheric and in a positive way, unsettling. The song, Witch Place,a story about a man who disappears and the ominous appearance of red-tinged soil that is discovered by his wife soon after near a church steeple. The song is penetrating, dark and clandestine and reason itself for us to hang, or at least dangle the folk label above 9Bach for disbelievers. My favourite track was “Wedi Torri” (It’s Broken), the harp solo was immensely cerebral, the harmonies enthralling and gentle, and the whole song is balanced on a knife edge of fragility, like a crystal swan figurine on the edge of a shelf. It is a poor comparison, but the last time instrumentals moved me in a similar way was the unstoppable nightmares I got when listening to Radiohead’s Kid A album. It’s not nightmares as such here, the music is really good and emotive; it feels like it is opening the floodgates between imagination, reason, and wonder and giving you a glimpse of musical spiritualism. The whole performance was great and in content it was a huge contrast to the other folk at the festival. Somewhere between Enya and the dark, gritty industrialism of 1990’s Portishead, the band is unabashedly confident and deserving of praise. Much like Jên’s fantastic star dress she appeared in their music is only just of this earth and lustrous in it’s beauty.. I will certainly be getting my hands on the albums when finances permit. I had a bit of time and managed to catch Merrymaker in the Clubrooms at Derby, I have recently written about their recent charity single “Nobody here wants a war” here. A worthwhile cause in itself, it was especially good in such an intimate venue. Village Folk took the room and filled it with some fine folk paraphernalia; photographs of the artists they have previously hosted (at their regular Chellaston sessions, see here) and gave a warm welcome to guests within. Their first year in the role (last year it was Winter:Wilson who spent a good time this year in Derby Cathedral) they were a great addition to the festival. Merrymaker themselves are also undergoing a readjustment and change of scene with Dan Sealey (Merrymouth, Ocean Colour Scene) and Adam Barry (Merrymouth and The Misers) being joined by solo artist Nikki Petherwick from Oxfordshire, bringing some new ideas and direction. As part of their set they played “Nobody here wants a war” with some class, as well as some of their older material which worked well such as “In the Midst of Summertime” a pacy, springy number that felt like rolling meadows and a fresh breeze. Their performance was well rehearsed, yet casual and the addition of Nikki gives them a fuller flavour of sound, her performance of “The Oak Tree” was acoustic simplicity but also categorically beautiful. Towards the end they played”This is England” a definitive track detailing an 85 year old’s perceptions of the Country that he grew up in, in my line of work something I hear quite often. It’s content, empathy and humour is not unlike Oyster Band’s more famous hits, but less bombastic taking aim and hitting out at celebrities and modern culture in equal measure. The Young’Uns were in attendance on the second day and brought their signature, popular and rather denuded version of folk music to a rapt audience. Much like that bit in films where a noble warrior puts down his weapon and fights with fists alone, the Young’Uns opt for folk in it’s rawest, human crux form with several a capella numbers combined with interesting modern influences and topics. The Young’Uns also have the bonus of having gut-wrenchingly strong, exploratory voices and a timeless tradition to their sound and craft which is rightly recognised by folk artist aficiados. Their song “Carriage 12” is like a song from a Western, you can imagine whipcracks, dusty sand and people drinking very bad rye whisky in the background. This it might sound like but in subject it tells a tale of the foiled terrorist plot that occurred on a carriage from Amsterdam to Paris in recent news but as if it had happened over a hundred years ago. The Young’Uns are creating modern mythologies using old standards and showing good mastery of Americana while they are at it. They really are the real world equivalent of the “Soggy Bottom Boys” with the amount of people that packed the room out to see them. Another one of their songs “Dark Water” made a lasting imprint too as is a poignant song constructed from the broken English of a refugee coming to this country on a raft. Resonating outwards and engulfing the audience there was nowhere to hide from this track. There is a braveness to The Young’Uns music which doesn’t shy from modern attempts to hide ugliness in society or how human beings treat each other. It plainly and melodically communicates what is happening and lets the audience make’s it’s mind up. It all still manages to entertain and move despite the risk that the music could use the veneer of the past to shroud the significance of what is being sung about, in fact it holds up the stories for all to see. This talent and driving moral compass makes the Young’Uns a force of authority for the heart of folk within the music community. On the third day Ninebarrow had the task of entertaining following the aftermath of what seemed like torrential weather. Despite this, their early slot, and a few minor technical hitches early on they went on and impressed me and the rest of the audience enormously. They have a particular brand of folk music that returns to nature and explores it’s uses (hence their name), and it is these inspirations that make their sound as inspired as it is. 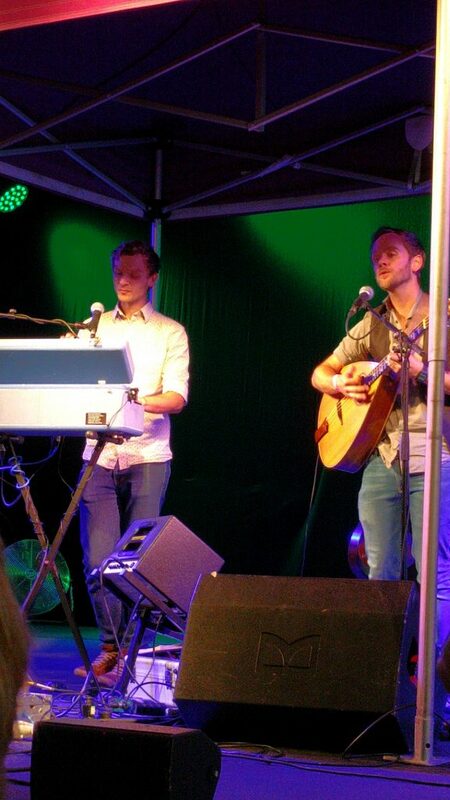 In this regard they have a gentle folk sound with hints of Simon and Garfunkel in their delivery and harmony. When singing “The Weeds”, a song about a man who has lost his home and life when he makes the rash decision to leave his wife or “Bold Sir Rylas” their darkest cover about the exploits and murder of a bloodthirsty witch, they sound quite uplifting no matter how dark the material. Their frank joy makes opening a bag of moths in a sack factory seem like the most innocent, happy thing you could ever do. Playing fairly light instrument-wise they rely on their affable voices to sweep the songs along which they do with aplomb, but there is an added distinction to their soundscape for they use a reed organ quite extensively. This is a relatively modern sounding take on the folk heritage, and such an integral part of the band that I would fear that removing it would likely remove the modernity, edge and anything of value still present within the song. As a band that Growing all the time and turning a few prominent heads we have certainly not seen the last of Ninebarrow. Like a pint of the black with a rum chaser the pairing of Ange Hardy and Lukas Drinkwater effectively portray a duo of mutual somber jibes and a suppressed manic, mutual deprecation of each other which works for the audience’s amusement. It is of course how many double acts work but their use of stage presence and humour is really well-timed; a few bad pun-like jokes (I actually love bad puns) and a bit of tomfoolery, they would not be out of place at some good venues of the Edinburgh Fringe should their muses depart in the same direction. If this sounds like it is uninteresting chaos and a slight, it certainly isn’t because much like their approach to music and use of technology they are innovators and their performances feel well practiced and organised. In order to add depth and fill a space around the two artists, several instruments such as harp and double bass (and sometimes voice) are recorded by Ange on a loop pedal and used throughout the song performances to great effect, but it would be nothing without what is played and Ange Hardy’s singular voice. Playing several tracks from her quite wonderful Findings album the corners of the Guildhall Theatre shook with the immense concentration of the crowd upon the musical performance. Together they pay wonderful, constructive tribute to songs of old with renditions of “The Pleading Sister, “The Trees They Do Grow High”, and little-heard “Bonny Lighter-Boy”. Her voice seems limitless, their chemistry undeniable, and all-in-all a very good addition to Derby Folk Festival. Apologies if your favourites are not mentioned, I would love to hear your impressions of the Festival in the comments below.. this just a snapshot of a wide range of exciting folk artists that were there on through the weekend. I cannot wait til next year. Very good summary of the bands I saw (Ange Hardy+Lucas Drinkwater,Mawkin,9Bach,The Young’Uns, Granny’s Attic, Ninebarrow) most of which I have bought or will be buying CDs and will seek out to see live again. I also enjoyed Sam Kelly & The Lost Boys. and the American band Poor Man’s Gambit. 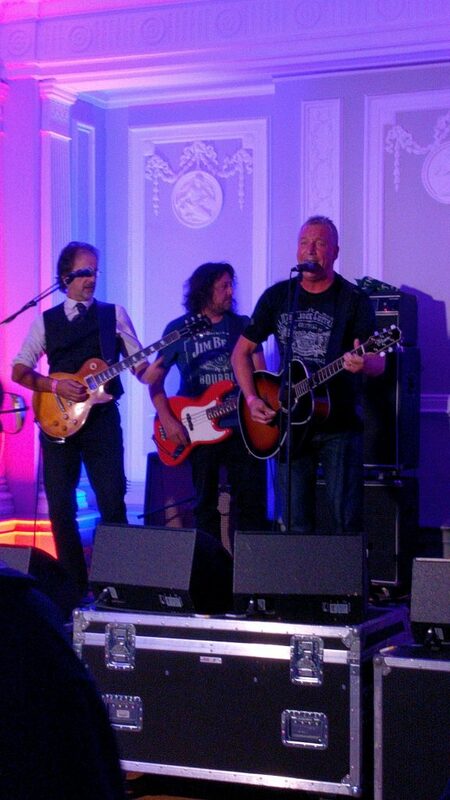 Some of the old guard were present too – Andy Irvine and Vin Garbutt are class acts in very different ways. Folk music has a breadth of style and age ranges that would shock non-folk audiences. It’s a shame that the demographic of the audience seems relatively narrow. Yeh agree, I am hoping to get the word out and stuff. Coming up with ideas, but it would be easier I think if I was about 10 years younger, but I reckon there must be other ways, maybe an appropriate Youtube series or something. I am seeing some young people at gigs so I dont think all hope is lost. I think in a way making a big deal of the category is a big problem. I think if you put a general music festival on and there were some folk artists in there, I think enough young people would enjoy it enough and get into it, kind of like a gateway artist anyway. I werent big on traditional when I started listening, but my appreciation has grown over the years.